Cold Air Guns use vortex tube technology and filtered compressed air to produce sub-freezing air as low as -30 deg F for numerous industrial spot cooling applications. With no moving parts to wear out, Cold Air Guns require no electricity, just a compressed air source. Cold Air Guns are most often used for cooling of metal parts, in the machining and repair of metals, plastics, wood, ceramics and other materials. Cold air machining outperforms mist coolants and substantially increase tool life and feed rates on dry machining operations. The effective cooling from a Cold Air Gun can eliminate heat-related parts growth while improving parts tolerance and surface finish quality. Cold Air Guns have adjustable temperature and flow settings; and some models have a frost free nozzle to eliminate mess from frost and condensation. The air consumption range is from 15 SCFM to 35 SCFM. High heat on a 40” saw blade caused Carolina Paper Company to suspend production frequently to allow the blade to cool. After installing the Vortec Cold Air Gun, production rates improved by 42% and scorching was eliminated. A ribbon of composite graphite material wraps aerospace structures in Vortec client MAG’s innovative VIPER® Fiber Placement Systems. 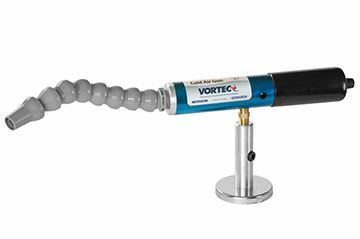 Vortec’s Cold Air Gun 610 ensures the composite tape achieves the correct shape without wrinkling. The Frost Free Cold Air Gun cools tools quickly and without the mess of liquid lubricants or frost from standard cold air guns. Used in a wide variety of applications including cutting and drilling, and will increase tool life and feed rates in dry machining operations.